Definition at line 85 of file DemandedBits.h. Definition at line 65 of file DemandedBits.cpp. Definition at line 69 of file DemandedBits.cpp. References llvm::AnalysisUsage::addRequired(), llvm::AnalysisUsage::setPreservesAll(), and llvm::AnalysisUsage::setPreservesCFG(). Definition at line 100 of file DemandedBits.h. 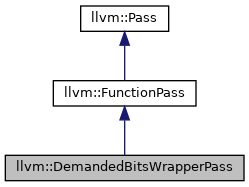 Definition at line 76 of file DemandedBits.cpp. Definition at line 302 of file DemandedBits.cpp. 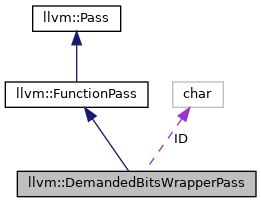 References llvm::dbgs(), llvm::dyn_cast(), llvm::SetVector< T, SmallVector< T, N >, SmallDenseSet< T, N > >::empty(), F(), llvm::APInt::getAllOnesValue(), llvm::APInt::getLimitedValue(), llvm::Type::getScalarSizeInBits(), llvm::Value::getType(), I, llvm::SetVector< T, SmallVector< T, N >, SmallDenseSet< T, N > >::insert(), llvm::instructions(), isAlwaysLive(), llvm::Type::isIntOrIntVectorTy(), LLVM_DEBUG, llvm::User::operands(), llvm::SetVector< T, SmallVector< T, N >, SmallDenseSet< T, N > >::pop_back_val(), second, and llvm::Twine::utohexstr(). Definition at line 295 of file DemandedBits.cpp. Definition at line 90 of file DemandedBits.h.